If you ride at night, it’s crucial that motorists see you on the road. You may already wear a bright cycling jacket or jersey, but its effect can be muted if you’re wearing a dark, low-visibility backpack on top of it. 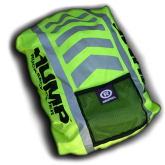 The Hump line of high-visibility backpack covers provides an excellent solution. 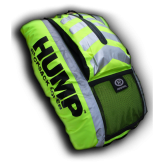 Hump is a brand of Respro (a UK-based company specializing in urban survival equipment) devoted to high-visibility backpack covers for cycling, jogging, hiking, and motorcycling. The company will ship its products anywhere, including the US, though its web site lists all prices in British pounds (January 2, 2012 exchange rate: £1 = US $1.55). Hump covers are constructed using a lightweight synthetic fabric and come in a range of colors, including red, orange, and blue, though I recommend the “Flo-Yellow” color. As I discussed in my recent Equipped column, Now You See Me: Bike Lights, Reflectors, and High Visibility, such a bright yellow-green color is most visible to the human eye and provides you with maximum visibility during daylight hours. For night riding, Hump covers feature reflective strips and/or chevron patterns that enhance visibility. (If you’re planning on using the cover only for night riding, you can purchase the Reflective Hump (£35.99), which is constructed entirely of reflective material.) 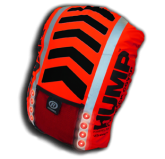 For even greater nighttime visibility, Hump offers covers with battery-powered, flashing LED lights, including the P15 Chevron (£49.99) and Vegas (£44.99, pictured ). You can visit the Hump YouTube channel to see them in action. Most Hump covers accommodate backpacks with a capacity of 25 to 35 liters, more than enough for most day packs. Basic models, like the Plain Hump (£17.99), are not waterproof. For watertight coverage, you’ll need to upgrade slightly to a model like the LC Hump (£22.99). If you’re interested, now is the time to buy—Hump currently offers free shipping anywhere in the world, though only for a limited time.